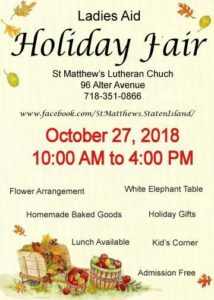 Events | Welcome to St. Matthew’s Lutheran Church on Staten Island, New York. Join us for our annual Holiday Fair this Saturday October 27 10AM-4PM. The admission is free and we will have homemade baked goods, lunch, flower arrangements, white elephant table and a kids corner. We are located at St. Matthews Church 96 Alter Ave Staten Island NY 10304.